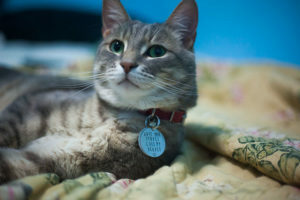 Without any ado, I’m going to dive into the question, essentially coming up with all the reasons Oshra’s cat is potentially hissing about, as well as some solutions to “resolve” those problems. Please note, if I leave anything out and you other cat owners can think of something else her cat may be trying to say, leave that in the comments down below along with your “resolution” to the problem! The more of us out there on the job of trying to make this cat happier the better! 1. Your cat may be trying to say he’s sick of all the changes. Now, if this is the case, there’s not a lot you can do for him besides give him time. Cats like steady lives, routines, they’re like the human beings amongst us that aren’t big fans of moving or changes in their lives at all. If you just acquired your cat 2.5 months ago, that’s one change. 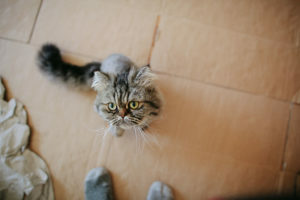 And then moving again – well it’s reasonable to believe your cat is just upset about having to get used to you, your old home, and then now a new home altogether. That’s a lot of change for a feline, and he might just need some time to adjust. 2. Your cat may be trying to say he didn’t like the move. Cats are not easy about moving in general, so the hissing could technically be solely about the fact that he’s still annoyed about the fact that you moved him from his old location at all. There are ways to make moves easier on cats, ones that I’ve outlined here, but no matter what you do, some cats are just not going to be a fan. Please take some time and read through that article and see if there’s anything in it that you haven’t implemented that you can still try to do. 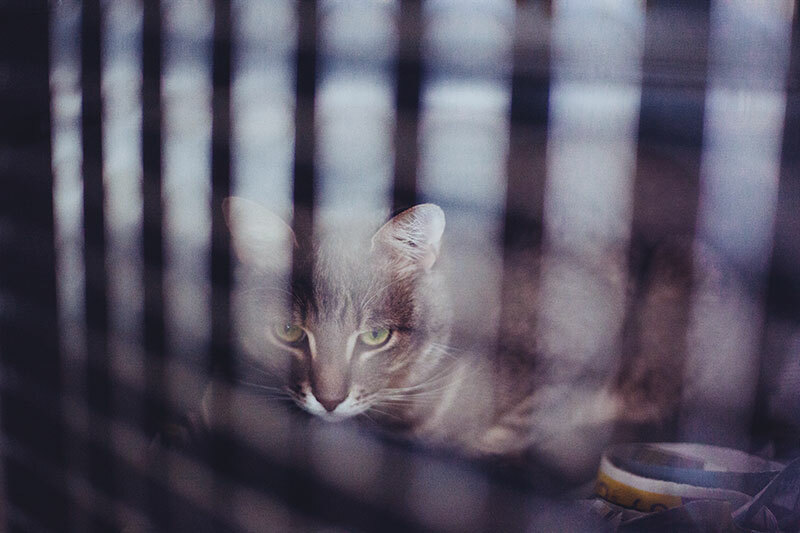 For example, if your cat still doesn’t seem to feel safe in your home, try giving your cat a “safe room” as though you’d just moved in yesterday and then slowly bring your cat out to the other rooms of the house. 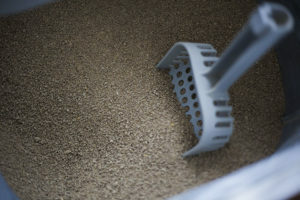 Also make sure that nothing else changed throughout the move – that you’re still using the same litter box, the same litter, the same food – all because too many changes make a cat’s head spin. One thing at a time with them, and very gradual changes if it’s at all possible. 3. Your cat may be trying to say he is bored in his new environment. 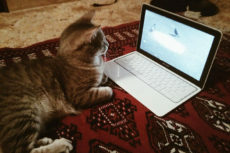 Indoor cats have a raw deal when it comes to entertainment – either their owners get that they need stimulation and provide it, or their owners don’t get it and they’re left with a bunch of pent up energy and nothing to do all day. Does that mean it’s bad to have indoor cats or that you can’t have a cat in a small apartment? Definitely not, not in my opinion, and I live in a studio apartment with my husband and cat and live and work full time in this space. 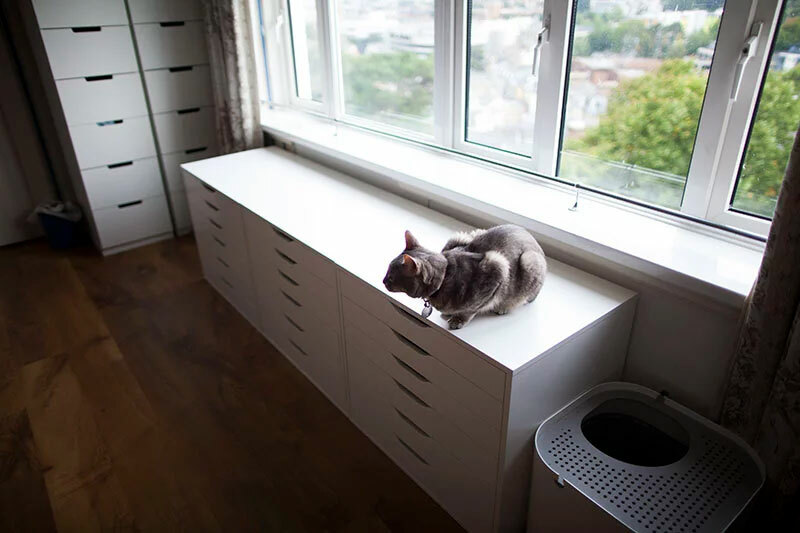 It just means you have to be a lot more sensitive to the boredom that a cat is likely to feel in a small space, and take steps to make your apartment more cat friendly and interesting to live in for them. How? Step 1 is always to make absolutely sure you have playtime with kitty at least once a day. If your fella is a lazy kitty cat like my fella is, I’m sorry about that and I know how hard it can be, but that doesn’t mean you get out of playtime with your cat. 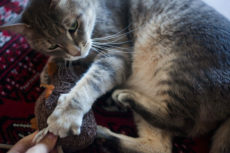 Try these techniques to encourage your cat to play with you, and make an effort for at least 10-15 minutes a day to play with your cat. If he’s not biting, he might need different toys or might just prefer to play at a different time of day (like at night). Or, again, he might just be lazy like mine, in which case, keep trying! Playtime will happen some of the time even if it doesn’t happen every single time. Step 2 to curing cat boredom is implementing as many “cat boredom cures” as you possibly can. 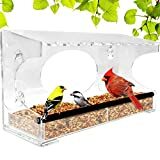 I’ve outlined the ones I could think of here, so I won’t rehash what I said in this article, but a couple ideas include easy-to-implement tips like a suction bird feeder outside your window and keeping it well stocked with bird food, getting a closed off fish tank with a beta fish to swim around in, and even something as simple as creating more nooks and crannies in your home so your cat has many places he loves to sleep in. Which leads straight into Step 3: use these recommendations to keep indoor cats happy in small apartments. They’re, again, not complicated and mostly have to do with making the most out of the small space you have. It’s harder to live with an indoor cat in a small apartment than it is to live in a bigger one, but it’s still completely possible for everyone in the household to be extremely content! 4. 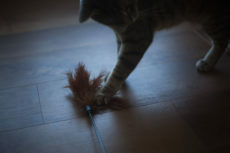 Your cat may have a lot of pent up energy. Cats are notorious for hissing when they have a lot of pent up energy. The way to release this energy is twofold, with the stress being on the first step. 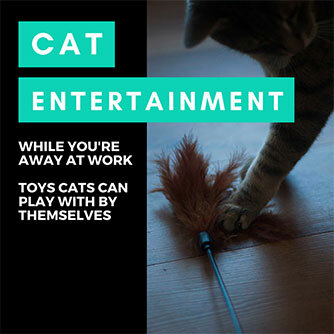 Step 1: Play with your cat. I’ve said it before and I’ll say it again, it’s gotta happen every day for at least 10-15 minutes. This is so important because cats, unlike humans, have a prey drive. 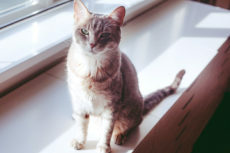 They have a biological need to hunt and if this isn’t “taken care of” through playtime, your cat’s energy may come out in the form of behavioural issues like hissing or “hunting humans” (i.e. scratching or batting at them). 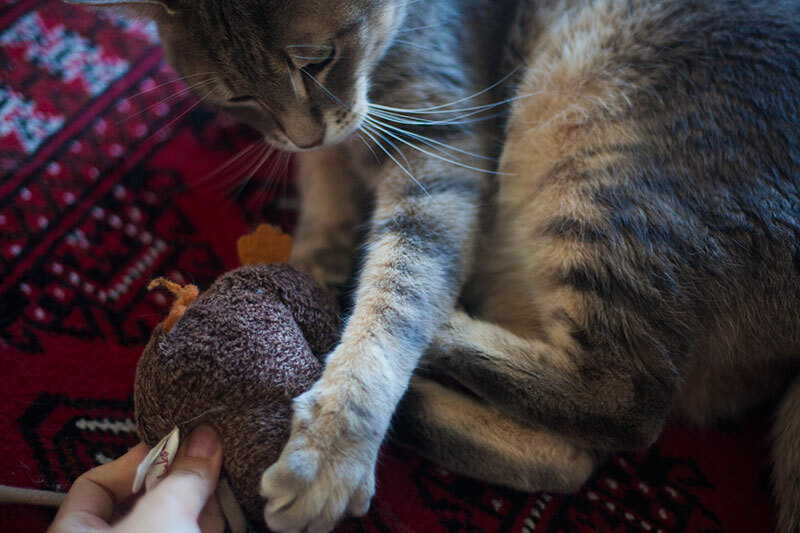 A good play session with your cat every day keeps him healthy and will help seriously reduce behavioural issues. If your cat isn’t engaging every time and you need to default to step 2 to get some exercise in and some energy out, no problem. You can even use step 2 if your cat is engaging each and every time you try to play with him and you just want to be sure he’s getting all the exercise he can into his day. Step 2: Encourage your cat to exercise. This is typically a lot easier than you think. Cat motivated by food as most are? Try using this workout technique. it’s the simplest way for me to get Avery to exercise, with 0 hassle or fuss from him, which is important to me because he will often refuse to engage in play time. You can encourage your cat to exercise passively, too, just use some of these techniques, that include making “napping” spots for cats in high places in your apartment, or finding a couple toys your cat is willing to play with on his own (Avery used to love these cat springs). Is it easy? Not always, since cats by nature are often very lazy, but give it a bit of effort and you’ll find it’s usually easier to get a cat to exercise than you might think. In a situation where you find your cat has begun hissing, absolutely positively take it as a message from your cat. He or she is definitely trying to tell you, “Something is not right!”/”Something is making me unhappy!” – and I don’t think anyone would argue otherwise. Since you have newly adopted your cat and just moved, the hissing most likely revolves around one or even all of the causes above, in my humble opinion. 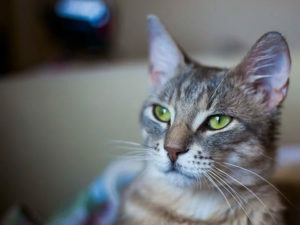 If your cat started hissing without having any environmental changes at all, I’d recommend taking him to the vet in case he might be sick, but his environment has changed so it’s more likely that’s what the hissing is connected to. If you had other cats, the issue might’ve been a squabble between them, but again that is a non-issue for you since you have no others. All in all, this is good news, considering you likely have a very narrow set of problems to run through, troubleshooting to determine which it could be. With a few adjustments to your apartment life that could take only hours to a couple days to begin to implement, your cat’s new hissing behaviour could disappear in no time. However, if you do whatever you can to get your cat to be comfortable in his new home and he’s still hissing, I would recommend taking him to a vet to get him checked out. There’s absolutely no doubt in my mind that you’ll figure out how to make him happy and that once that’s done, this behaviour will go away. Good on you for knowing something was off, and for taking steps to try to figure out what that was! Why Do You Think Oshra’s Cat Began Hissing? Now I’m turning the conversation to all of the rest of you! 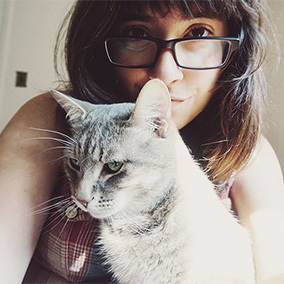 Do you have any further advice for Oshra and her cat? 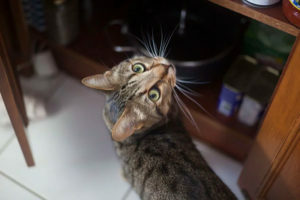 Did I leave anything (important or even small suggestions) out that you think might be the cause of his distress or that might help in resolving her cat’s anxiety and thus his new hissing behaviour? If so, please leave a comment letting us all know down below! You gave excellent advice, Miz Elise. Us cats have long memories. Maybe the kitty used to live in a small place and its bringing back bad memories. His hoomons are new to him. With a recent move, he is back to distrusting them. New place doesn’t smell right. Maybe it smells like another pet that lived there before. A smaller place means kitty is feeling confined and maybe forced to socialize when the trauma of moving is still too fresh. My mom is a cat magnet with 70+ rescues…she always advises her friends with problem cats to give the kitty Harry Potter’s Cloak of Invisibility. Instead of talking to the cat every time it walks into the room…ignore it. Allow it to feel invisible. This works especially well with feral cats who are living indoors. After awhile the kitty feels secure and will initiate socializing on its own. Thank you so much for you input, Herman! 🙂 That’s a trick I never would’ve thought of – to not give kitty too much attention until he/she feels secure! Thank you, and will remember that tip for the future! I think you did an excellent job answering her question. Is the cat hissing in one area or everywhere? Try cleaning with your regular products. If there is a rug, either clean it yourself or have it cleaned. There may be lingering scents from the previous occupants the cat is associating you with at first.